ObamaCare: to be honest, I think I do not yet have a sufficient understanding of the whole matter, nor do I think most Europeans do, since everything, in this important and vital field, is—or seems to be—very different over here. Thus, what has been going on in the US in the past few months is perhaps a bit “too American” for us. Hence my silence on this issue … until now. What made me change my mind? What moved me to break my silence is this post in Italian by Oscar Giannino—as usually I asked Mirino to translate into English some excerpts from the post: thank you once again my friend! Giannino is among the most respected economic opinion-makers in Italy, a columnists for several Italian newspapers, and the author of many publications on economic issues. What I appreciated most in Giannino’s post is that it’s focused first and foremost on the differences between Europe and America, which, in turn, somehow helps me focus what is peculiar about the American health system—the ways of Providence are infinite! But first of all, to make it easier for American readers to understand what Giannino means, let me summarize what the Italian health system is all about and how it works. The National Health System offers inexpensive healthcare to all European citizens. However, even though the Servizio Sanitario Nazionale ranks number 2 on the World Health Organization’s list of top countries for quality health care services, there are some state hospitals that are substandard, providing a comfort level below what most Americans would expect. These hospitals are normally found in Southern Italy (where, paradoxically, public health spending per capita are twice or three times as high as in the Northern Italy…). In-patient treatments which are covered include tests, medications, surgeries during hospitalization, family doctor visits, and medical assistance provided by paediatricians and other specialists. The health system is also responsible for drugs and medicines, out-patient treatments, and dental treatments. This being said, however, can we really speak of free healthcare for all? Well, if you are employed your health insurance is paid in part by employers and in part by wages withheld from workers’ paychecks. Of course, if you are unemployed you don’t have to pay anything, and you still get healthcare. Now let’s see what Oscar Giannino has to say. I’ll be brutal. The enthusiasm of the media, even more than that of the Italian left wing, for Obamacare, indicates two things. They don’t know the reform, or they pretend not to know it. They’re only drinking a toast to the political patron. That almost no one has read the 2,800 pages of Obamacare is obvious. Why would they otherwise exult, if the reform excludes clandestine immigrants from every cover? In Italy they would accuse anyone who came up with such a thing as a fascisto-racist. What is there of “left wing” in a reform whose aim is to save the hole—estimated to be six times the US GDP—of American private insurance companies, that nevertheless remain private but with tariffs and services decided by politics, and with levels of debit charged to enterprises and tax payers? In Italy anyone who proposed such an idea would be accused of being a lackey to insurance companies. Who are the great beneficiaries of the reform? The insurance companies, whose shares in recent months have in fact climbed by 30%. I then omit what would happen in Italy, if State Prosecutors had intercepted the numerous telephone confrontations during the final days before the risky ballot to the House of representatives. How would they manage to avoid filing corruption charges to Nancy Pelosi and Obama himself, when the ballot is “bought” in exchange for concessions for every constituency whose vote counts so much? Rhetoric is an indissoluble part of politics. But rarely does one hear so much rhetoric diffused in Europe for Obamacare, which has been compared to the approval of the Civil Rights anti- segregation Act of 1964, or even to the Constitution written by the Founding Fathers, in the skillful emphasis by which President Obama and the heads of the Democratic party knew how to enclose the vote to the tightest margin with which the law would pass, in spite of the defection of forty democrat congressmen. 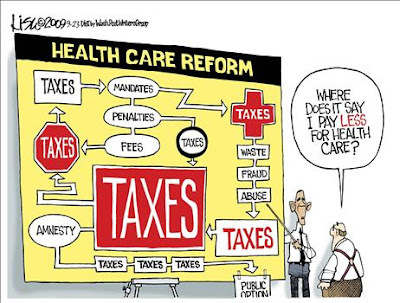 For every American cautious of the many taxes he or she will have to pay in future, for a national debt increasing towards 100% of the GDP, such an onerous reform—to save private insurance—entrusting everything to politicians, induces a distrust very different from the enthusiasm expressed by European (right or left wing) statists. But Obama has preconstituted a cunning advantage. At the time of his re-election campaign in 2012, when the reform will begin to enter in force with the greater covers, the accounting effects will not be evident. Nor they will be much more evident four years later, when Obama might intend to “bequeath” the White House to another Democrat: the taxes and the additional, obligatory contributions come into force as from 2014, but the public levels of the costs of the pharmaceutical prescriptions won’t be released before 2018. They will fall on his successors, and on future taxpayers. A slow passage of Lord and Master’s politics, with private companies kept on a tight rein by party leaders. The European Public Health systems, directly managed by the State, and only integrated by private companies, are more coherent. The Obamacare is a real, fundamental attack on the America we love. That’s why the democratic left à la Pelosi is so fanatically favorable. How ghastly! If we were Americans, we would be rallying in the streets. I can't support the health care bill, either--not that it makes any difference. It's so complex that I doubt anyone understands all of it, some of the things it includes are bad ideas (e.g., forced purchasing of insurance), and some things were left out that should have been in (e.g., tort reform). Worse, it's going to be years before we'll be able to sort out the bad from the good and then try to make changes. Oscar Giannino has written a fantastic article. Thanks for sharing!